It might sound like a tall order, but we think that there is a 2015 Honda Pilot for practically every driver thanks to the five different trim levels you have to choose from here at Central Illinois Honda Dealers. Aside from the addition of the fifth trim level, the Pilot has remained mostly unchanged from its 2014 model, and we think that’s a good thing. The previous Pilot has been one of the most successful vehicles we offer here at Central Illinois Honda Dealers, and bringing back the options and standard features from 2014 is a smart choice. Let’s take a look. LX- This entry-level trim comes standard with Bluetooth, Honda’s i-MID infotainment system, a rearview camera, steering wheel-mounted controls, Pandora radio connectivity, SMS texting, and much more. EX- Upgrading to the EX trim level adds on 18-inch alloy wheels, Honda’s HomeLink remote system, a security system with remote entry, 10-way power adjustable driver’s seat, and an exterior temperature indicator. SE- The new Special Edition trim takes what the EX has and then adds on a rear DVD entertainment system, a one-touch power moonroof, a 115-volt power outlet, SiriusXM radio, and unique alloy wheels. EX-L- A leather-wrapped steering wheel and leather-trimmed interior put you in the lap of luxury with the EX-L, which also comes with heated front seating, power-adjustable front passenger seating, and an auto-dimming rearview mirror. Touring- This top-of-the-line trim level comes with everything found on the EX-L and adds on a 650-watt stereo system, roof rails, body-colored power-folding side mirrors, body-colored parking sensors, and more. Each model comes standard with a 3.5L V6 engine rated at 250 hp, and the 2015 Honda Pilot 2WD earns an EPA-estimated 25 highway mpg. * With seating for up to eight and as much as 87 cubic feet of cargo storage space available, it makes for a perfect family or work vehicle. We can only tell you so much about the 2015 Honda Pilot and its trims in words; the best way to know if any of them is right for you is to take one for a test drive. 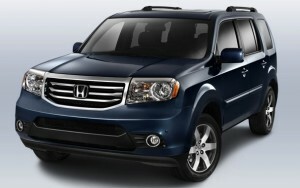 Visit a Central Illinois Honda Dealer today for some quality time behind the wheel of this wonderful SUV. *Based on 2015 EPA mileage ratings. Use for comparison purposes only. Your actual mileage will vary depending on how you drive and maintain your vehicle.